Carrier and Company Interiors Ltd. is a husband and wife partnership of design principals, Jesse Carrier and Mara Miller. 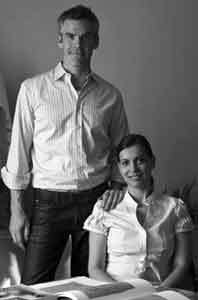 Jesse and Mara have the benefit of a combined total of 20 years experience working with some of New York's premier designers before opening their doors in 2005. Clients include Anna Wintour, Bob Pittman, and Jane Rosenthal, to name a few. Their work has been published in The World of Interiors, Vogue and Traditional Home. Additionally, Jesse is a contributing editor and stylist for Vogue & Men's Vogue.